Air Miller Hall utilizes CO2 monitoring in high volume spaces to provide adequate outside air and ensure optimal indoor air quality. Lights All building lighting is controllable to automatically shut off when no one is in the room. Energy Miller Hall uses 23.5 percent less energy as compared to a similar sized building. Water More than half of all the rainwater that falls on the roof is collected, stored underground, and used for irrigation. Alan B. Miller Hall is a symbol of the enduring spirit of William and Mary. For the same entrepreneurial spirit that built W&M, Alma Mater of the Nation, lives on in Miller Hall, the home of The Mason School of Business. In the earliest discussions of Miller Hall, the goal was to create a place of vision, community and innovation. 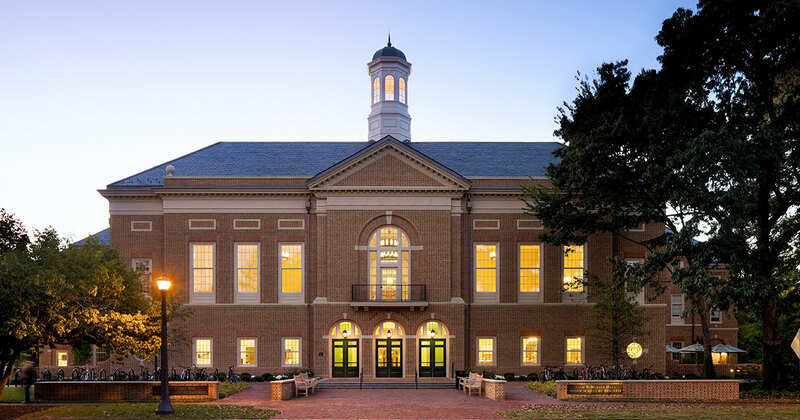 As the "western gateway" of the W&M campus -- the historic Christopher Wren Building, the oldest college building in the United States, sits on the eastern edge -- Miller Hall is designed to last for generations. It was awarded a LEED Gold Certification by the U.S Green Building Council, a testament to The Mason School’s commitment to sustainability. But in so many ways, what's inside the building and the memories that are created will last for generations, encompassing lifetimes of dreams and aspirations. Miller Hall stands as a physical symbol of the entrepreneurial spirit and vision that manifest in the Mason School of Business. Named for W&M alumnus Alan B. Miller, and designed by Robert A.M. Stern Architects, L.L.P., Miller Hall is a crossroads for learning. Most importantly, it is the home of a teaching philosophy rooted in active learning, collaboration, mentoring and teamwork. For the first time in the business school’s history, the undergraduate and graduate programs were under the same roof at the start of the academic year in 2009. A public dedication was held on October 2, 2009.